As we’ve already noted, no area of church life is exempt of our need for God’s power. That includes even record keeping and reporting. Increase the possibility of pulling on God’s power in record keeping by identifying people to get involved who have the spiritual gifts most suited to this kind of ministry. 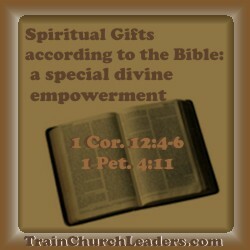 Remember, spiritual gifts are God’s special divine empowerments to do ministry His way. Keeping records focuses on the gathering and compilation of data whether into a computer or on paper — a task-oriented ministry. The following gifts tend to be more task-oriented and consequently could be ones to pull on in records keeping. What primarily distinguishes the gifts from one another could be the motivating factor. When looking for someone to do records keeping, consider if any of these factors matters in that particular area. If it does, look for that particular fit if it does. People with the spiritual gift of administration will want to bring order and organization through records. People with the spiritual gifts of helps will want to assist leaders to do their ministry well by providing them with the records they need. People with the spiritual gift of service will simply see a task that needs to be done and want to accomplish it. This entry was posted in Records & Reporting .